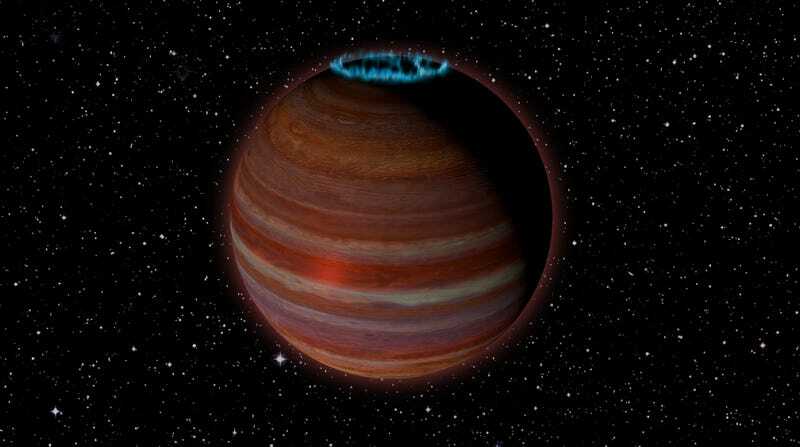 Artist impression of the object called SIMP0136. Various news outlets have been discussing a strange object in space, which may or may not be a planet. New measurements show that what was thought to be a brown dwarf—essentially a “failed star” that is too small to generate nuclear fusion, but too big to be a planet—might be a planet after all. But that’s far from the strangest part of this story. Brown dwarfs are mysterious, round objects floating in space that are more than 13 times the mass of Jupiter, meaning they are too large to be considered planets. Scientists recently used the Karl G. Jansky Very Large Array in New Mexico to observe four brown dwarfs, plus the proposed planet-brown dwarf crossover, for seven hours each. The radio emissions from these objects indicated they could have magnetic field strengths perhaps 200 times greater than Jupiter’s—which is already far stronger than the Earth’s. The universe, well, it’s gonna do what it’s gonna do, and it doesn’t really care about our human definitions.